On Saturday I made a plan for Sunday. I planned to walk for coffee. Get on the T. Watch football. Drink. T & Cab Home. First of all, my plan was not based on getting drunk. It was based on at least football games and not wanting to watch the clock and the drinks because of driving. When I woke up on Sunday, I went to get some breakfast and coffee at Dunks. I didn’t realize it would be raining Sunday. Not only was it raining, but it was a rain/snow hurts-when-it-hits-you mix. I started rethinking my plan as I got in the shower. When I looked out the window after, it was snowing. 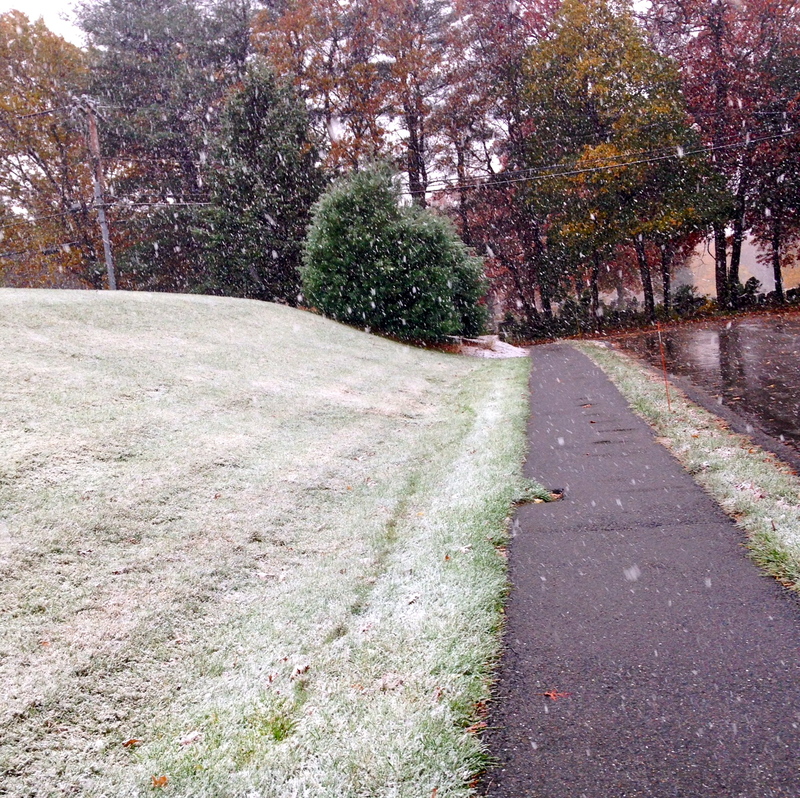 Big, beautiful, white, sticks-to-the-ground flakes. I was running on the low side, and was getting to walk almost two miles to the T. I had to figure out how to balance the already low, with the exercise, along with spike the adrenaline from the excitement was going to give me. As I was changing my pump site, I remembered not having supplies with me, and packed a pouch with the other battery, a spare pump site, a needle and a bottle of humalog. I also threw my glucagon in my purse. I didn’t like my purse being a little more bulky, but I knew it was the smart choice. Especially since I wasn’t driving. I had a roll of smarties before the walk and headed out. I wanted to stop and take a picture in front of every yard. It was just so beautiful. About 3/4 of the way there, I was feeling a little bit low and then my Dex went off. With a high alarm. I was really confused. I kept walking and tested when I got to Starbucks. I was in fact high (but not too high). I blamed it on the smarties combined with the adrenaline. I bolused for my coffee and went on my way. By the time I got to the bar, all I wanted was water. It just didn’t make any sense to me. I tested and was over 300. I went off to the bathroom and leaned down to smell my pump site. It was the unmistakeable smell of insulin. When I pulled the site, it was kinked. I gave myself a shot for the number and for the drink I was about to have. I had spread my stuff out on one of the sinks and of course someone came in as I was filling up the syringe. I felt completely awkward. I then had to tuck my shirt up to put a new site in. That didn’t feel awkward either. I know it was what I needed to do. I was hoping more than anything that the new site would work (and it did). I am glad I was able to catch the kinked site before I started to feel sick, but it still is not a great thing to experience. The rest of the day was uneventful diabetes wise and I couldn’t be happier. I feel compelled to say I love it when a plan comes together… even if it wasn’t the way you planned originally. Also, it only took me a minute to understand what the T meant. Yup, diabetes does give us some awkward moments!! But glad it all worked out in the end.